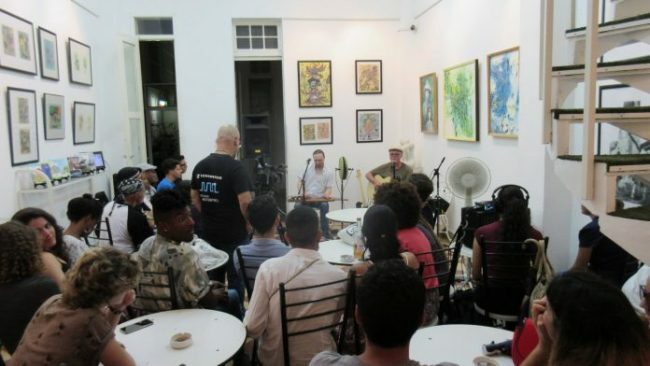 On May 9th, 2018, Canadian Blues musicians Robert Davis and Melvin Fraser held a concert at Casa Obrador (casaobrador.com), a café-gallery located in the Cuban city of Santa Clara. The event, which began at 8:30 in the evening, attracted a large audience, mostly young people attending a concert of this kind for the first time. The musicians opened the concert – which lasted more than two hours – with Caldonia, a classic of the genre, to continue with other well-known songs from the blues repertoire. Fraser showed his vocal qualities and more particularly, he charmed the audience with his mastery of the lapsteel, an instrument totally unknown to Cubans, and by popular demand, he performed a solo at the end of the concert. Davis, who has played the blues repertoire for many years in his hometown of Toronto, has charmed with his use of the harmonica. A special moment of the evening was the playing of the song Sitting on Top Of The World for which they were joined by local musician Yasel Giralt who played the laud. In this performance with this rare nine-measure blues, he gave a Cuban touch to one of the most anthological songs of the blues repertoire. Casa Obrador is a cultural space – created by two Cuban entrepreneurs living in the city of Montreal – that welcomes various culture and art forms focused on Cuban cultural development, including a publishing house, an art gallery, a shop and a café located in the aforementioned city of the central region of Cuba. This concert is part of Casa Obrador’s efforts to build cultural bridges between Cuba and Canada.